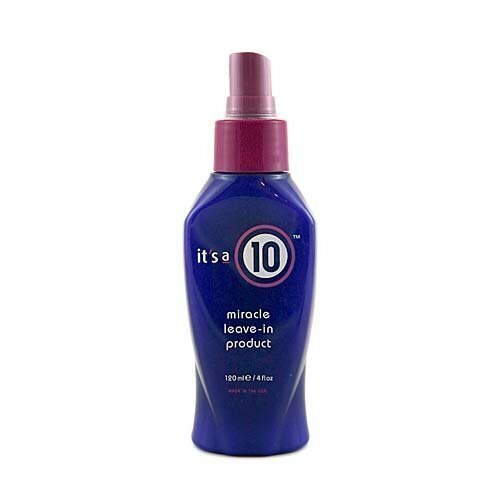 I usually lean toward cheaper products but in this case I just have to share with you one product I can’t live without: It’s a 10 spray leave in conditioner ($13.20/4 oz., amazon.com). I use 5-7 sprays on damp hair before I comb post-shower. Although, this product comes out as a spray it’s actually a much thicker consistency, like a cream. Even when my hair is dry I will spray a bit into my hands and run it though my ends. This product is marketed as an all around “miracle”: detangler, leave-in conditioner, thermal protector, adds shine, controls frizz… and it really works. Some days I will use 10-15 spray (usually, the day after I’ve beaten-up my hair with an updo or too much harsh hairspray) and my hair never feels heavy or greasy. As for the thermal protective quality of the product I can’t say I trust only using “It’s a 10.” If I know I’m going to flat iron I use a separate heat protector (See “Product of Interest: CHI Shine Infusion”). All I can say is it’s the best hair detangler ever. I can’t comb my hair without it, or at least I never try!